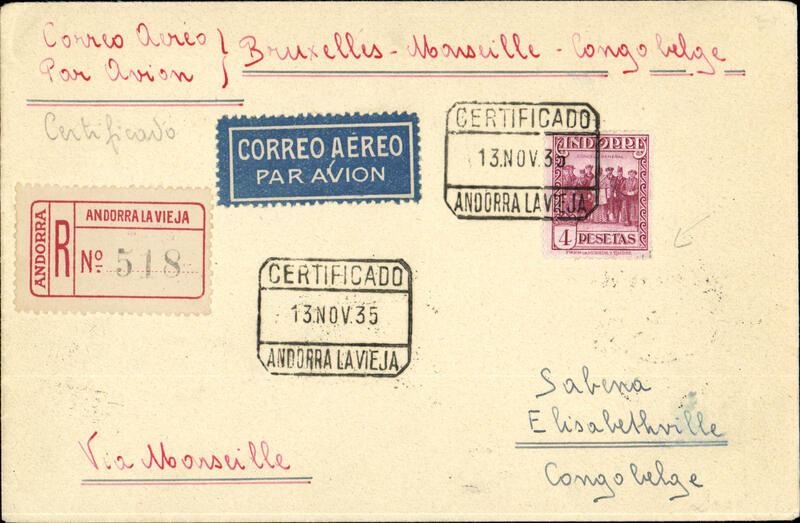 Rare Andorra acceptance for the Belgian Congo, for carriage on the extension of the regular Congo service to Elisabethville, Andorra la Vieja to Elisabethville, ?21/11, via Seo de Urgo 14/11, Calaf 14/11 and Marseilles 14/11, Victor Nawratil registered (label) etiquette cover, franked Spanish PO Andorra 4P SG24, cat £28 used (scarce on cover), canc Certificado/13 Nov 35/Andora Lavieja boxed registration ds, ms "Correo Aereo Par Avion/Bruxelles-Marseille-Congo Belge". One of the six believed to have been accepted at Andorra for thew service to Elisabethville by Sxabena. A scarce item in superb condition.